Caboolture Hospital is helping to tackle youth unemployment in the Moreton Bay region with two innovative training programs developing the next generation of health care workers. 49 Moreton Bay school-leavers were now ready to take on careers in the health industry, after graduating this month from the Caboolture Health Care Academy and Metro North School-Based Traineeship programs. 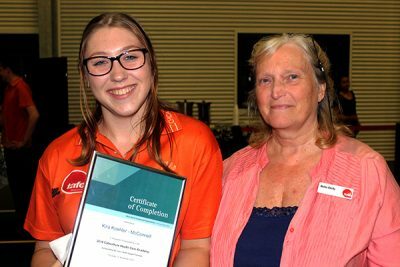 More than 220 students have graduated from the Metro North School Based Traineeship and Caboolture Health Care Academy programs since traineeships started in 2005. The two programs represent a unique and innovative partnership between the Australian Training Company and TAFE Queensland Brisbane (Caboolture Campus) and Metro North HHS hospitals and health facilities, with students training across a range of facilities including Redcliffe, Caboolture and Kilcoy hospitals. The intake of students increased this year across various streams including nursing, administration, allied health, operations and food services, with a further increase planned for 2019. Caboolture Hospital Executive Director Dr Lance Le Ray said programs like these gave young people a dose of local medicine, through exceptional training coupled with hands-on experience. “Workforce trends suggest that one in four Queensland jobs will be in the health industry over the next five years, so it makes sense that Caboolture Hospital is leading the way by investing in this next generation of workers, to meet this growing demand,” Dr Le Ray said. “Initiatives like these are a terrific example of how communities can work together to tackle youth unemployment, while taking strategic steps to future-proof the health industry and address growing demand,” he said. The Caboolture hospital has also trialled an Internship Program this year, linked to the Caboolture Health Care Academy. “Three interns received a 12-month full-time contract with Food Services and Operational Services after leaving school to help them continue to develop and grow into future health care workers,” Dr Le Ray said.